you're likely to pass along your journey. Despite its interrupted beginnings, the Volta a Portugal is not only the longest cycling event after the three Grand Tours but one of the oldest. Sponsored by a newspaper partnership, the ‘Daily News’ and ‘The Sports’, the first edition of the race was held in April 1927. A 20-day tour, comprising of 2,000 kilometres over 18 stages, it was fittingly won by a Portuguese rider, Augusto de Carvalho. Designed to unite the nation, the Volta’s inaugural event was a virtual circumnavigation of the country. However, due to the lack of an official organiser it was four long years before the tour reappeared, from 1931 until 1935, before the outbreak of the Spanish Civil War, followed by World War II caused its temporary cessation. Like its Spanish compatriot, the Vuelta a España, the Volta was staged over three weeks from the 1940’s until 1980. But with interest declining, the race gradually reduced in duration; initially down to two weeks, in 1981, and then to its present format of ten stages, since 2005. In what is a heavily crammed cycling calendar, the annual Portuguese event is scheduled immediately between the Tour de France and the Spanish Tour, just weeks later. While it took 40 years, until 1967, before a non-Portuguese cyclist finally won the camisole amarela (the yellow jersey presented to the winner of the General Classification), the last three decades have produced a variety of winners from 10 different nations. But the new millennium has belonged to Spanish riders, no more deservedly than David Blanco, who currently holds the record for the highest number of wins, five in total, between 2006 and 2012. 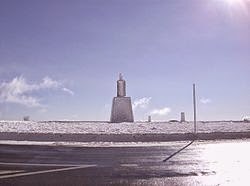 The Volta’s version of Spain’s Sierra de la Pandera (1,779 metres), France’s Mont Ventoux (1,912 metres) and Italy’s Monte Grappa (1,745 metres) is the climb up to the summit of the Serra da Estrela, the highest point of mainland Portugal. Standing just two turns of a crank below 2,000 metres, the climb to its well-known tower was first used in 1971 when Portugal’s most decorated cyclist, Joaquim Agostinho, won the stage victory as well as the yellow jersey a few days later. Born in Brejenjas, a small village 50 kilometres north of Lisbon, Joaquim Agostinho didn’t commence his international cycling career until the age of 25. At 18, he began his ‘working’ life as a soldier, fighting in Angola and Mozambique, in what became the long-running Portuguese Colonial War, between 1961 and 1974. A guerrilla-style conflict, similar to the protracted Vietnam War of the sixties and early seventies, soldiers manned and supplied fortified positions from which they would locate and crush small enemy forces. 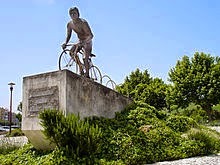 It was here, where Agostinho met his captain, Jean-Pierre Douçot, who later became his mechanic after discovering his cycling prowess in his role of transporting by bicycle, messages along the military lines of communication. Finally becoming a professional cyclist at 27, Agostinho wasted little time in making up for lost opportunity. He won the Volta three times in a row, between 1970 and 1972, as well as finishing a narrow second to José Manuel Fuente in the Vuelta a España of 1974. But probably his most significant achievements were his sustained performances in the 1978 and 1979 Tour de France. Competing in his mid to late thirties against cyclists the calibre of five-time winner Bernard Hinault, he finished third on each occasion, behind the Frenchman and the Netherlands’ Joop Zoetemelk. Trig point, marking the highest point of mainland Portugal. A competitor to the last, Joaquim Agostinho tragically died in 1984, during the 5th stage of the Volta ao Algarve (Tour of the Algarve). Leading the race towards its finish in Quarteira, the helmetless cyclist was badly injured after crashing into a dog that had blundered its way into the path of the oncoming peloton. While able to remount and finish the stage along with the other riders, his health deteriorated dramatically. Driven by ambulance to the nearest hospital that could treat him, in Lisbon, over 200 kilometres away, he drifted into a coma from which he never recovered. A gritty and gifted climber, Joaquim Agostinho completed 12 of the13 appearances he made in the French Grand Tour, between 1969 and 1983. Of the four stages he won during his fond relationship with the race, his most renowned was his stage 17 victory up the Alpe d'Huez. On the 14th of its 21 smoothly surfaced hairpin bends, is the bust of this perhaps underrated Portuguese champion, who on the 15th of July, 1979, made the mountain his own.